Participants from the IVLP "Library Management" program from Mongolia pour over the University of Iowa's collection during their visit in October. In October of this year, a five-member group of Librarians from Mongolia participated in a three-week International Visitor Leadership Program (IVLP) on Library Management. Beyond Washington, DC, the group traveled to Baltimore, Maryland; Albany, New York; Akron Ohio; Iowa City, Iowa; and Reno, Nevada. The 19th century printing block resides in the University of Iowa’s Special Collection . Visits to public libraries were a principal component of the program and in one location, Iowa City, local librarians were grateful for the unexpected assistance of an IVLP participant. 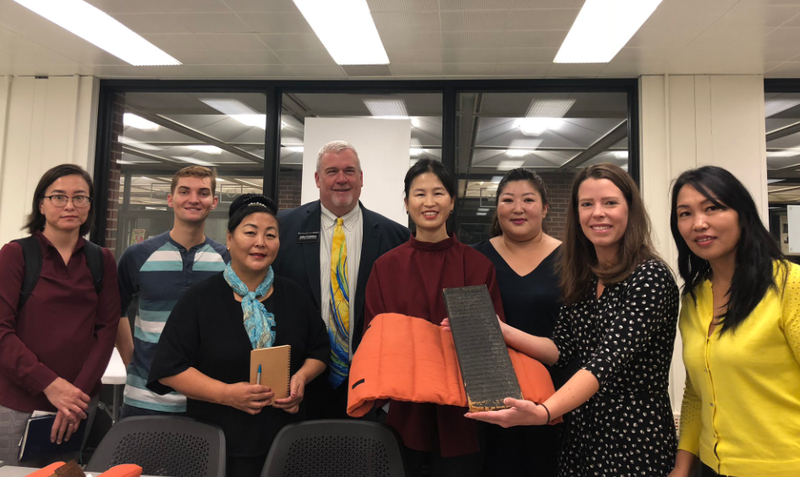 The University of Iowa brought out an old wood block tablet from Mongolia to demonstrate the library’s broad reach in showcasing other cultures for the community. The library staff were delighted when one of the visitors, Ms. Altantsetseg Victor, Librarian and Program Coordinator in the American Corner, Public Library of Khovd Province, translated this historical tablet from the old Mongolian script into modern Mongolian. One of the group’s interpreters then translated the tablet into English. This was an exciting moment for visitors and library staff and once again demonstrated the value of the IVLP in bringing other cultures to American communities and promoting understanding – literally. Following is the contemporary Mongolian script followed by the English translation. Нэрт хаадын бардам эрдэнэ хэмээгч хамаг дайсныг дарагч их мянган ертѳнцѳд шашны дээд судар буй. Богд баатар чамдаа мѳргѳм үү. Дээд богд чамдаа алгаа хавсран мѳргѳм үү. Гэлэнгүүдээ! Бадам эрдэм мэт энэ судрыг аваад хотол дотроо үйлдэхүйн тэр хэмээвээс тэнгэр хүн лүгээ ертѳнц дахиныг хамгийн сайн тусыг хийгээд энх амгалан хүртэх болвоос сайн болюу. Гэлэнгүүдээ! Хэрвээ миний энэ судрын үйлээр хохимой модон дахь сахих утсыг оновоос түүнээс навч цэцэг жимс дэлгэрэх бѳгѳѳд биед дахин нүгэл хурваас урд үйлдсэн үйлийн үр үгүй болмой. Praying to you, the Bogd hero. Praying hands folded to you, the supreme Bogd. Monks! Take this scripture, a knowledge jewel, to the people. This will bring good to the universe with heavenly human beings in it and bring them peace. Monks! If you strike the rope warding the skeleton tree with the deed of my scripture then the leaves, flowers and fruits will bloom and, if sin comes back to body, karma inherited by the course of previous lives will disappear. University of Iowa Librarians with the IVLP group and the tablet. POST TAGS: Asia, International Exchange, IVLP, Libraries, Mongolia, Professional Exchange, Public Diplomacy, Soft Power, U.S. Department of State.